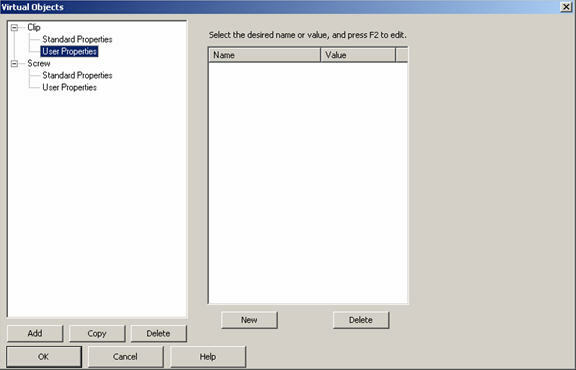 This function allows you to add to the BOM database objects without a graphic representation. This is useful in that these objects are counted in a BOM even though they have no graphic representation. 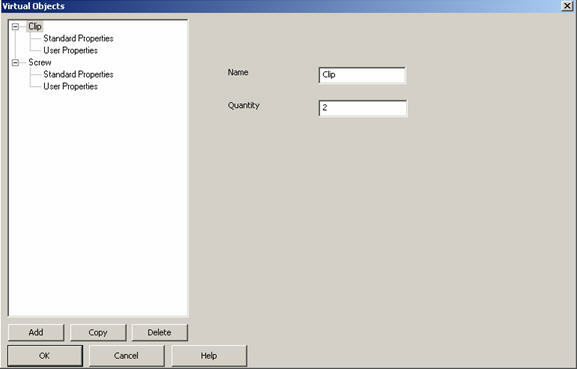 Click Tools>BOM and Table>Virtual Objects. The Virtual Objects dialog appears, similar to that shown below (under Dialogs). This dialog has a tree on the left that contains a list of all available virtual objects. Each object has standard properties and user properties. Select Standard Properties or User Properties for an object in the tree. A pane appears for that object. If you selected Standard Properties, the second pane below (under Dialogs) appears. The elements in this pane are the same as those on the File>Properties>File Properties pane. For descriptions, see File and Part Properties. If you selected User Properties, the third pane below (under Dialogs) appears. The elements in this pane are the same as those on the File>Properties>File User Props pane. For descriptions, see File and Part User Properties. Configure the panes as desired. Creates a copy of the selected virtual object. The new object is named "Copy of <object name>"
Removes the selected virtual object. Exits the function, accepting all the changes. Exits the function, cancelling all the changes done during the session.